The ozone mixing tank is a kind of water treatment equipment. It is to fully mix water and ozone, thus achieving purposes of sterilization, retaining freshness and avoiding secondary pollution for the producing of mineral pure water. 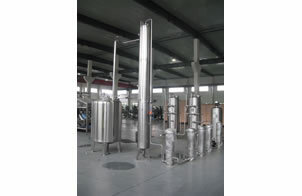 The equipment is a kind of stainless steel oxidation tank whose dimension is D350×H4000mm. A 5um titanium aerator inside the tank can segregate ozone into minute bubbles to contact with water. The height of contact water column is 3.5m. Ozone enters into the tank from the top where an air-outlet is equipped. And at its bottom, a water outlet is also fitted. Jiangsu Topling Machinery Co., Ltd is a professional manufacturer and supplier of ozone mixing tank in China. Apart from ozone mixing tank, we have other products: water filling line, juice filling production line, carbonated drink filling line and related equipments including juice processing (mixer), capping machine, bottle unscrambler, etc. Our products have got the standards of CE, and ISO9001-2008. With good quality and affordable price, Our company successfully offers many production lines for many well-known brands at home and abroad, such as Coca Cola, PEPSI. If you need ozone mixing tank, please contact us.